Be the first to download this book Primary School In Japan: Self, Individuality And Learning In Elementary Education (Japan Anthropology Workshop Series), By Peter Cave as well as let reviewed by finish. It is quite easy to read this publication Primary School In Japan: Self, Individuality And Learning In Elementary Education (Japan Anthropology Workshop Series), By Peter Cave considering that you do not should bring this printed Primary School In Japan: Self, Individuality And Learning In Elementary Education (Japan Anthropology Workshop Series), By Peter Cave anywhere. Your soft file book can be in our device or computer so you could take pleasure in reviewing anywhere and every single time if needed. This is why lots numbers of people additionally review the books Primary School In Japan: Self, Individuality And Learning In Elementary Education (Japan Anthropology Workshop Series), By Peter Cave in soft fie by downloading and install guide. So, be among them that take all benefits of reviewing guide Primary School In Japan: Self, Individuality And Learning In Elementary Education (Japan Anthropology Workshop Series), By Peter Cave by online or on your soft file system. Primary School In Japan: Self, Individuality And Learning In Elementary Education (Japan Anthropology Workshop Series), By Peter Cave. Is this your downtime? Just what will you do then? Having extra or leisure time is really remarkable. You could do everything without pressure. Well, we intend you to exempt you few time to read this book Primary School In Japan: Self, Individuality And Learning In Elementary Education (Japan Anthropology Workshop Series), By Peter Cave This is a god book to accompany you in this spare time. You will not be so hard to recognize something from this book Primary School In Japan: Self, Individuality And Learning In Elementary Education (Japan Anthropology Workshop Series), By Peter Cave More, it will certainly help you to obtain far better info and also encounter. 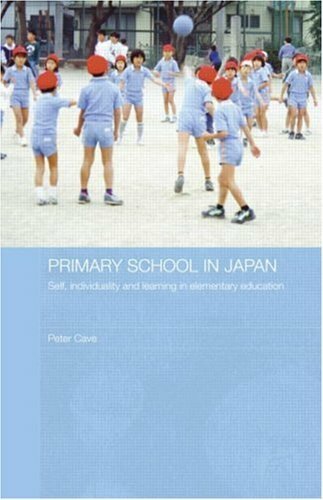 Also you are having the terrific tasks, reviewing this book Primary School In Japan: Self, Individuality And Learning In Elementary Education (Japan Anthropology Workshop Series), By Peter Cave will certainly not add your mind. The reason of why you can get and also get this Primary School In Japan: Self, Individuality And Learning In Elementary Education (Japan Anthropology Workshop Series), By Peter Cave earlier is that this is the book in soft documents form. You can read the books Primary School In Japan: Self, Individuality And Learning In Elementary Education (Japan Anthropology Workshop Series), By Peter Cave any place you desire also you are in the bus, office, house, and also other locations. But, you could not need to move or bring the book Primary School In Japan: Self, Individuality And Learning In Elementary Education (Japan Anthropology Workshop Series), By Peter Cave print anywhere you go. So, you will not have heavier bag to bring. This is why your selection to make much better concept of reading Primary School In Japan: Self, Individuality And Learning In Elementary Education (Japan Anthropology Workshop Series), By Peter Cave is really handy from this case. Knowing the method how to get this book Primary School In Japan: Self, Individuality And Learning In Elementary Education (Japan Anthropology Workshop Series), By Peter Cave is also valuable. You have been in appropriate website to begin getting this details. Obtain the Primary School In Japan: Self, Individuality And Learning In Elementary Education (Japan Anthropology Workshop Series), By Peter Cave link that we provide here as well as see the web link. You can purchase the book Primary School In Japan: Self, Individuality And Learning In Elementary Education (Japan Anthropology Workshop Series), By Peter Cave or get it as soon as possible. You could quickly download this Primary School In Japan: Self, Individuality And Learning In Elementary Education (Japan Anthropology Workshop Series), By Peter Cave after getting bargain. So, when you need guide swiftly, you could directly receive it. It's so very easy therefore fats, right? You need to choose to this way. Just link your tool computer or device to the web hooking up. Obtain the modern technology to make your downloading Primary School In Japan: Self, Individuality And Learning In Elementary Education (Japan Anthropology Workshop Series), By Peter Cave completed. Also you do not intend to check out, you can directly close guide soft file and open Primary School In Japan: Self, Individuality And Learning In Elementary Education (Japan Anthropology Workshop Series), By Peter Cave it later on. You can also effortlessly get the book anywhere, since Primary School In Japan: Self, Individuality And Learning In Elementary Education (Japan Anthropology Workshop Series), By Peter Cave it is in your gadget. Or when remaining in the workplace, this Primary School In Japan: Self, Individuality And Learning In Elementary Education (Japan Anthropology Workshop Series), By Peter Cave is additionally advised to review in your computer gadget. The balance between individual independence and social interdependence is a perennial debate in Japan. A series of educational reforms since 1990, including the implementation of a new curriculum in 2002, has been a source of fierce controversy. This book, based on an extended, detailed study of two primary schools in the Kinki district of Japan, discusses these debates, shows how reforms have been implemented at the school level, and explores how the balance between individuality and social interdependence is managed in practice. It discusses these complex issues in relation to personal identity within the class and within the school, in relation to gender issues, and in relation to the teaching of specific subjects, including language, literature and mathematics. The book concludes that, although recent reforms have tended to stress individuality and independence, teachers in primary schools continue to balance the encouragement of individuality and self-direction with the development of interdependence and empathy. Peter Cave is a lecturer in Japanese Studies at the University of Manchester, and was formerly lecturer in the Department of Japanese Studies at the University of Hong Kong. His main research interest is Japanese education in comparative context.